This week's Tuesdays with Dorie (TWD) recipe was chosen by Whitney, April, and Elizabeth of Celestial Confections: Cranberry Lime Galette. What I love about a galette is how easy it is to make. You don't need a pie pan, and since it's supposed to look rustic, no need to worry about making it look perfect! This galette was filled with both fresh and dried cranberries, apples, lime zest, and fresh ginger, tossed together with some raspberry jam (I used orange marmalade), lime juice and brown sugar. The layer of ground nuts and bread crumbs lining the bottom of the galette was subtle but perfect. The combination of cranberries and lime is wonderful - I love a good cosmopolitan, but I've never seen the cranberry and lime combination in sweets before. 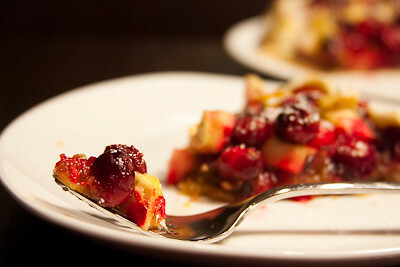 The cranberries were definitely more tart than I expected them to be in this galette, but it was still delicious. Part of my crust opened up and my filling spread more on one side than the other and it seems to me that the thinner side ended up sweeter. I'm guessing that may be due to the fact that the layer of cranberries was thinner and and therefore cooked down more while in the oven. Thanks Whitney, April, and Elizabeth, for hosting this week. I will definitely be making this again - loved the cranberry and lime combination! (I loved it so much I ate 3/4 of the galette between the time it came out of the oven last night and when I went to bed!) If you would like the recipe, you can find it here. Make sure you check out the TWD Blogroll, to see how everyone else enjoyed this sweet and oh so tart treat! - If you prefer a dessert that isn't tart, you'll have to add more sugar to this recipe. Or, consider adding chopped crystallized ginger. Halving the filling might also create a sweeter result as well. - I had to add a rim of foil around my galette for the last 10 minutes of baking to prevent it from over-browning. I love sour candy too. Actually I love tart & tangy so this would be totally up my alley! You are on a roll. 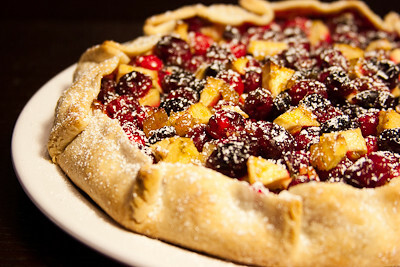 I ♥ the very idea of this rustic galette...wow! Look at the colours...gorgeous! Jaime - this seriously could not look more amazing. And not to mention delicious. And I love the addition of lime!!! 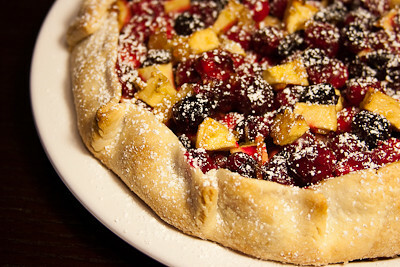 your galette looks amazing!! i bet my mom would love this as she adores tart fruits! that is just a gorgeous galette! what pretty colors! i used crystallized ginger instead of fresh in mine, and it was good...spicy kick but a little extra sweetness. cranberries and orange are a natural and delicious pairing, so i'm all for your use of marmalade! great work, jaime. This Galette just look fabulous!